American Drew Bob Mackie Sleigh Bed With Crocodile Embossed Leather PanelsThe Bob Mackie Home - Classics Collection offers custom designed hardware that evokes the grandeur of haute couture and adds a sense of comfort to every room and setting in your home. This collection brings a fresh twist to traditional styling with its soft, antique bleached mahogany finish and truly unique veneer inlay. Haute couture meets classic grandeur in the Bob Mackie Sleigh Bed where traditional aspects of gracious living are given a modern twist. It features classic flourishes such as spiraled bun feet combined with the Art Nouveau influenced crocodile embossed leather panels. This striking bed is fused with a decidedly fresh, urbane flair that is perfect for any modern home. Just call it Art Nouveau Riche. Eclectic, contemporary or transitional, the Sunday Morning Leather Bed is so versatile that it will be a perfect fit in any room. The two-toned leather head and foot boards with square panels are rich in looks and detail, and will give your bedroom a luxurious feel that you will appreciate every day of the week. 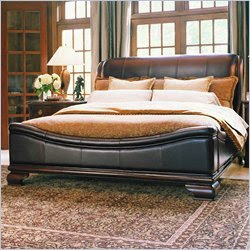 So start your days in style with the American View Sunday Morning Leather Bed. Stanley Furniture Provincia Grand Salon BedThe Provincia Bedroom and Dining Collection projects the stately style and Old World charm of a centuries-old chateau. The real beauty of the collection's classic European styling is that it will fit in with other design styles. Inspired by formal French country furniture, the inherent beauty of the Provincia Grand Salon Bed is emphasized by dramatic detail. Crafted with care, the striking leather/wood combination of the headboard and footboard, its rich color and dramatic curves, will make the Provincia Grand Salon Bed the focal point of your bedroom. Modus Capri Low Profile BedThe Hudson Collection is crafted from ash solids and veneers. 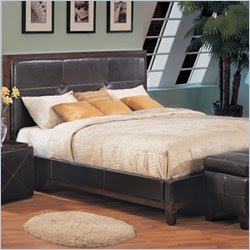 It offers a mixture of all leather beds and a wood framed bed with a leather panel. Frames are constructed from solid wood and corner blocked to ensure rigidity. Stanley Furniture Estate Carriage House Leather BedEstate - Classic 18th century English styling mixed with decorative detailing creates the fresh furniture style for this collection. 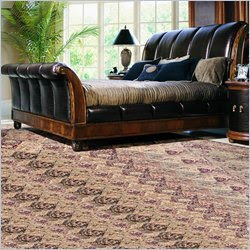 Beautify your rooms with a collection fit for royalty with Estate. Luxurious and comfortable, this sleigh-style bed is skillfully enhanced by a generously padded leather headboard and curved moldings. Reflecting the tradition and style of gracious English manor living, the Estate Carriage House Leather Bed will bring a stately elegance to your decor. Stanley Barbados Sunbury Sleigh BedBarbados - Gracious in the British style of living, Barbados takes a fresh view of traditional design. This is a collection that speaks of history in a casual, yet confident voice. Graceful and sophisticated, the inspiration for the Barbados Sunbury Sleigh Bed comes from the relaxed British-style Island living of over a century ago. The elegantly turned legs combined with the sleigh-style design of the padded headboard are beautifully enhanced by the rich mahogany veneers and a dark, luscious finish. 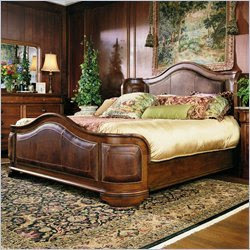 So create an elegant paradise in your very own bedroom with the Barbados Sunbury Sleigh Bed. Stanley American Modern Low Profile Leather BedAmerican Modern - Contemporary and confident, with a decidedly urban point of view, America Modern combines unexpected accents and unwavering attention to detail to give you the flexibility of creating your own look. 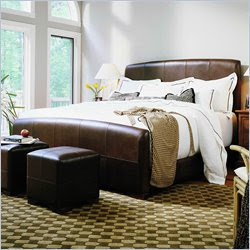 The American Modern Low Profile Leather Bed is a fine example of contemporary styling. The rich dark finish of the wood underlines the visual impact of the headboard's two single button tufted leather panels. Clean lines and an urban flair will make this bed the center of attention. Whether your bedroom decor is contemporary or eclectic, the Brookland bed is the perfect fit. An updated version of the classic sleigh design, the headboard, footboard and side rails are covered in a rich dark brown leather. This bed will be a thing to treasure for a long time to come.